Like a lot of writing on technology in the past couple of decades, Steven Johnson makes a good point and then overreaches. 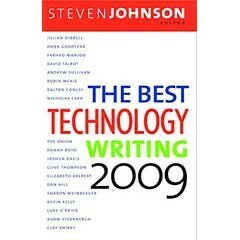 In his introduction to these pieces from Web sites and magazines (Wired, Discover, Atlantic, Technology Review, New Yorker), he points out that most of them are about the present, while tech writing has been habitually about wonders to come. This leads him to dismiss thoughts of the future entirely, which misses the point: The introduction of so much new technology so quickly requires attempts to understand its real world meaning, if we're to have any control over the future at all. He does a fine job selecting the writing in this volume, though. There's absorbing reporting, like Dana Goodyear on the cell phone novel phenomenon among adolescent girls in Japan (leading to a lucrative new category in traditional book publishing there), and Joshua Davis on the guy who discovered a fatal flaw in the Internet. New tech roles in the 2008 election are evaluated in pieces on the Obama campaign and Nate Silver's approach to polling, and Andrew Sullivan writes a deft if somewhat obsolete essay on blogging. Dalton Conley's brief look at "time and money in the information age" yields unsurprising but quantified conclusions: Because of new tech, top wage earners are working more, and there's greater income disparity between the middle and the top. The evaluative essays cover the usual suspects with mixed results. Nicholas Carr's "yes, but," discover-a-trend-by-interviewing-yourself piece on how the Internet makes him impatient with "deep reading" is familiar (and appropriately followed by an Onion expose, "Area Eccentric Reads Entire Book"). Clive Thompson's similarly first person analysis of the "digital intimacy" enforced by Facebook and Twitter ("what's it like to never lose touch with anyone?") is thought-provoking and sensitive to this new phenomenon. Sharon Weinberger analyzes the effects on privacy of GPS and Google Earth, while Dan Hill's almost surreal narrative of pervasive surveillance is classically chilling. Luke O'Brien writes about a new game by the designer of Sim City, which is embedded with the cultural, economic and political assumptions hidden from players. The new game (Spore) applies a brand of Intelligent Design to biological evolution. The book drifts off with some familiar natterings by Wired's "Senior Maverick" Kevin Kelley, and Clay Shirky's call for a mouse-driven future, in which he misunderstands the nature and importance of story so completely that he resurrects my fears about what the virtual world can carelessly destroy. But on the whole this is a very useful book, and it's a paperback, too.